American meteorologist mission specialist astronaut 1987-2002. Status: Inactive; Active 1987-2002. Born: 1952-01-26. Spaceflights: 3 . Total time in space: 22.96 days. Birth Place: Bronx, New York. Grew up in Yonkers, New York. Educated CCNY; Rutgers. Official NASA Biography as of June 2016:Mario Runco, Jr. PERSONAL DATA:� Runco was born in the Bronx, New York, on January 26, 1952. Raised in the Highbridge section of the Bronx near Yankee Stadium, his family moved to Yonkers, New York, in his early teen years. He is married to the former Susan Kay Friess of Sylvania, Ohio; they have two children, Maria and Carl. He enjoys ice hockey, baseball, softball, camping, model railroads, toy train collecting and astronomy, among other interests. He played intercollegiate ice hockey on the City College of New York and Rutgers University teams. Runco's parents Mario and Filomena Ragusa Runco, still reside in Yonkers, New York, and Sue's parents, Fredrick and Margaret Bidlack Friess, reside in Sylvania, Ohio. EDUCATION:� Graduated from Sacred Heart School, Bronx, New York, in 1966 and Cardinal Hayes High School, Bronx, New York, in 1970. Received a bachelor of science degree in Earth and Planetary Science from the City College of New York in 1974, a master of science degree in Atmospheric Physics from Rutgers University, New Brunswick, New Jersey, in 1976, and an honorary doctor of science degree from the City College of New York in 1999. SPECIAL HONORS:� Awarded the Defense Superior Service, Defense Meritorious Service, NASA Exceptional Service, Navy Achievement and Navy Pistol Expert Medals. Also awarded three NASA Space Flight Medals (STS-44, STS-54 and STS-77), two Navy Sea Service Deployment Ribbons (USS NASSAU and USNS CHAUVENET), and the Navy Battle Efficiency Ribbon (USS NASSAU). Runco was also the recipient of the City College of New York's Townsend Harris Medal (1993) and the Cardinal Hayes High School John Cardinal Spellman Award (1993). As an undergraduate, he received the City College of New York Class of 1938 Athletic Service Award. EXPERIENCE: After graduating from Rutgers University, Runco worked for a year as a research hydrologist, conducting groundwater surveys for the U.S. Geological Survey on Long Island, New York. In 1977, he joined the New Jersey State Police and, after completing training at the New Jersey State Police Academy, he worked as a New Jersey State Trooper until he entered the Navy in June 1978. Upon completion of Navy Officer Candidate School in Newport, Rhode Island, in September 1978, he was commissioned and assigned to the Naval Research Lab in Monterey, California, as a research meteorologist. From April 1981 to December 1983, he served as the meteorological officer aboard the Amphibious Assault Ship USS NASSAU (LHA-4). It was during this tour of duty that he earned his designation as a Naval Surface Warfare Officer. From January 1984 to December 1985, he worked as a laboratory instructor at the Naval Postgraduate School in Monterey, California. From December 1985 to December 1986, he served as commanding officer of Oceanographic Unit 4 and the Naval Survey Vessel USNS CHAUVENET (T-AGS 29), conducting hydrographic and oceanographic surveys of the Java Sea and Indian Ocean. His last assignment within the Navy was as fleet environmental services officer, Pearl Harbor, Hawaii. Runco joined NASA in 1987 and remained on active duty as a NASA astronaut until 1994. NASA EXPERIENCE:� Selected by NASA as an astronaut candidate in June 1987, Runco qualified for assignment as an astronaut mission specialist in August of 1988. A veteran of three space flights (STS-44 in 1991, STS-54 in 1993, and STS-77 in 1996), Runco has logged over 551 hours in space, which includes a 4.5-hour spacewalk during his STS-54 mission. His technical assignments to date include having served in Operations Development, where he assisted in the design, development and testing of the space shuttle crew escape system; in Mission Support at the Software Avionics Integration Laboratory (SAIL), where he performed test and evaluation of space shuttle mission-specific flight software; at the Kennedy Space Center as astronaut support, where he assisted in preparing space shuttle missions for launch and in the Mission Control Center as a Capsule (Spacecraft) Communicator (CAPCOM). Runco currently serves as an Earth and planetary scientist; as the lead for Science and Utilization of the International Space Station's Destiny Module Science Window and the Window Observational Research Facility (WORF), both of which he helped design; as the project manager for the Lunar Habitation Systems Project Fast Track and as the JSC lead for spacecraft window optical requirements. SPACE FLIGHT EXPERIENCE:� On his first flight, Runco served on the crew of STS-44 aboard the Space Shuttle Atlantis, which launched on the night of November 24, 1991. The primary mission objective was accomplished with the successful deployment of a Defense Support Program (DSP) satellite. In addition, the crew conducted two Military Man-in-Space Earth Observation experiments, three radiation monitoring experiments, and numerous life sciences experiments in support of long-duration space flights. The mission concluded after completing 110 orbits of the Earth. Atlantis returned to a landing on the lake bed at Edwards Air Force Base, California, on December 1, 1991. Mission duration was 6 days, 22 hours and 50 minutes. Just over 1 year later, Runco served as a mission specialist on the crew of STS-54 aboard the Space Shuttle Endeavour. STS-54 (January 13 to 19, 1993) launched and landed at the Kennedy Space Center in Florida. The 6-day mission featured the deployment of a NASA Tracking and Data Relay Satellite (TDRS-F) and carried the Diffuse X-Ray Spectrometer (DXS) in the payload bay. This astronomical instrument, designed to expand the knowledge of stellar evolution, scanned the local vicinity of our Milky Way galaxy and recorded the low-energy X-ray emanations believed to originate from the plasma remnants of an ancient supernova. Crewmate Greg Harbaugh and Runco also became the 47th and 48th Americans to walk in space during a 4.5-hour space walk designed to evaluate the limits of human performance during Extravehicular Activities (EVAs) in anticipation of the construction of the International Space Station. In what was called the ��Physics of Toys,�� which has since become a popular children's educational video, the crew also demonstrated how everyday toys behave in space to an interactive audience of elementary school students across the United States. Mission duration was 5 days, 23 hours and 38 minutes. Runco also served as a mission specialist on the crew of STS-77 aboard the Space Shuttle Endeavour (May 19-29, 1996). STS-77 carried a number of technology development experiments as well as a suite of microgravity science experiments. The technology development experiments included two deployable satellites, both of which he deployed. For the deploy of the Spartan/Inflatable Antenna Experiment, Runco was the Remote Manipulator System (Robotic Arm) operator. The other deployable was a small Satellite Test Unit (STU) that used residual atmospheric drag and the Earth's magnetic field for attitude control and stabilization. STS-77 also featured the fourth flight of a SpaceHab module as an experiment laboratory. Runco also filmed some additional Physics of Toys scenes for a sequel to the original educational video and subsequently made several appearances on the children's television show, Sesame Street. Mission duration was 10 days and 39 minutes. Born January 26, 1952, in the Bronx, New York, but considers Yonkers, New York, to be his hometown. Married to the former Susan Kay Friess of Sylvania, Ohio. They have two children. His parents, Mario & Filomena Runco, reside in Yonkers, New York. Her parents, Frederick & Margaret Friess, reside in Sylvania, Ohio. Graduated from Cardinal Hayes High School, Bronx, New York, in 1970; received a bachelor of science degree in meteorology and physical oceanography from the City College of New York in 1974, and a master of science degree in meteorology from Rutgers University, New Brunswick, New Jersey, in 1976. Enjoys ice hockey, softball, racquet ball, snow skiing, camping, hiking, and astronomy. Played intercollegiate ice hockey on the City College of New York and Rutgers University teams. Awarded the Defense Superior Service, Defense Meritorious Service, NASA Exceptional Service, Navy Achievement and Navy Pistol Expert Medals. Also awarded two NASA Space Flight Medals (STS-44 and STS-54), two Navy Sea Service Deployment Ribbons (USS Nassau and USNS Chauvenet), and the Navy Battle Efficiency Ribbon (USS Nassau). Mr. Runco was also the recipient of the City College of New York's Townsend Harris Medal (1993), and the Cardinal Hayes High School John Cardinal Spellman Award (1993). As an undergraduate, he was awarded the City College of New York Class of 1938 Athletic Service Award. After graduating from Rutgers University, Runco worked for a year as a research hydrologist conducting ground water surveys for the U.S. Geological Survey on Long Island, New York. In 1977, he joined the New Jersey State Police and, after completing training at the New Jersey State Police Academy, he worked as a New Jersey State Trooper until he entered the Navy in June 1978. Upon completion of Navy Officer Candidate School in Newport, Rhode Island, in September 1978, he was commissioned and assigned to the Navy Oceanographic and Atmospheric Research Lab in Monterey, California, as a research meteorologist. From April 1981 to December 1983, he served as the Meteorological Officer aboard the Amphibious Assault Ship USS Nassau (LHA-4). It was during this tour of duty that he earned his designation as a Naval Surface Warfare Officer and Officer of the Deck. From January 1984 to December 1985, he worked as a laboratory instructor at the Naval Postgraduate School in Monterey, California. From December 1985 to December 1986, he served as Commanding Officer of the Naval Survey Vessel USNS Chauvenet (T-AGS 29), and conducted hydrographic and oceanographic surveys of the Java Sea and Indian Ocean. His last assignment within the Navy was as Fleet Environmental Services Officer, Pearl Harbor, Hawaii. Runco joined NASA in 1987. Selected by NASA as an astronaut candidate in June 1987, Runco qualified for assignment as an astronaut mission specialist in August of 1988. His technical assignments to date include having served in Operations Development, where he assisted in the design, development and testing of the Space Shuttle crew escape system; in Mission Support, at the Software Avionics Integration Laboratory (SAIL), where he performed test and evaluation of Space Shuttle mission-specific flight software; at the Kennedy Space Center, as astronaut support, where he assisted in preparing Space Shuttle missions for launch, and in the Mission Control Center as a Capsule Communicator (CAPCOM). A veteran of three space flights, STS-44 in 1991, STS-54 in 1993 and STS-77 in 1996, Runco has logged over 551 hours in space. On his first flight, Runco served on the crew of STS-44 aboard Space Shuttle Atlantis which launched on the night of November 24, 1991. The primary mission objective was accomplished with the successful deployment of a Defense Support Program (DSP) satellite. In addition, the crew conducted two Military Man-in-Space experiements, three radiation monitoring experiments, and numerous medical tests in support of long duration space flights. The mission was concluded after completing 110 orbits of the Earth. Atlantis returned to a landing on the lakebed at Edwards Air Force Base, California, on December 1, 1991. Mission duration was 6 days, 22 hours and 50 minutes. Runco next served as a mission specialist on the crew of STS-54 aboard Space Shuttle Endeavour. STS-54 (January 13-19, 1993) launched and landed at the Kennedy Space Center in Florida. The six-day mission featured the deployment of a $200-million NASA Tracking and Data Relay Satellite (TDRS-F). Also carried in the payload bay was the Diffuse X-Ray Spectrometer (DXS). This astronomical instrument scanned the local vicinity of the Milky Way galaxy in the direction of the Constellation Orion recording the low-energy X-ray emanations believed to originate from the plasma remnants of an ancient nearby supernova. The data collected by DXS will help scientists better understand stellar evolution. Crewmate Greg Harbaugh and Runco also became the 47th and 48th Americans to walk in space during a 4.5-hour space walk designed to evaluate the limits of human performance during extravehicular activities (EVA). The flight also conducted several medical and scientific experiments. Included in these were investigations to better understand the human immune system's response to cancer. The crew also demonstrated the physics principles of everyday toys to an interactive audience of elementary school students across the United States. Mission duration was 5 days, 23 hours and 38 minutes. 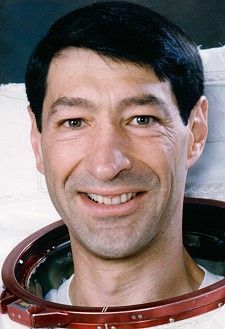 Runco most recently served as a mission specialist on the crew of STS-77 aboard the Space Shuttle Endeavour (May 19-29, 1996. STS-77 carried a number of technology development experiments as well as a suite of microgravity science experiments. The technology development experiments included two deployable satellites both of which were deployed by Runco. For the deploy of the Spartan/Inflatable Antenna Experiment Runco was the Remote Manipulator System operator. The other deployable was a small Satellite Test Unit (STU) which would use residual atmospheric drag and the Earth's magnetic field for attitude stabilization. STS-77 also featured the fourth flight of a SpaceHab module as an experiment laboratory. Mission duration was 10 days and 39 minutes. Runco is currently assigned to the Payloads and Habitability Branch of the Astronaut Office to work payloads and habitbility issues for both Space Shuttle and International Space Station operations. Family: Astronaut. Country: USA. Flights: STS-44, STS-54, STS-77. Projects: STS. Agency: USN. Bibliography: 12, 5960. 1952 January 26 - . Birth of Mario Jr 'Trooper' Runco - . Nation: USA. Related Persons: Runco. American meteorologist mission specialist astronaut 1987-2002. 3 spaceflights, 23.0 days in space. Flew to orbit on STS-44 (1991), STS-54, STS-77..
1987 June 5 - . NASA Astronaut Training Group 12 selected. - . Nation: USA. Related Persons: Akers, Allen, Andy, Bowersox, Brown, Chilton, Davis, Foale, Harbaugh, Jemison, McMonagle, Melnick, Readdy, Reightler, Runco, Voss. Mission Specialists: Bachelor's degree in engineering, biological science, physical science or mathematics and minimum three years of related experience or an advanced degree. Vision minimum 20/150 uncorrected, correctable to 20/20. Maximum sitting blood pressure of 140/90. Height between 150 and 193 cm.. First selection after the Challenger accident. 1962 applicants, 117 finalists. Reported to Johnson Space Center on August 17, 1987, to begin their one year training. Seven pilots and eight mission specialists. Two female mission specialists, including the first black woman astronaut. Ten military officers and five civilians (including three from NASA Johnson and one from NASA Marshall). 1991 November 24 - . 23:44 GMT - . Launch Site: Cape Canaveral. Launch Complex: Cape Canaveral LC39A. Launch Platform: MLP1. LV Family: Shuttle. Launch Vehicle: Space Shuttle. STS-44 - . Call Sign: Atlantis. Crew: Gregory, Hennen, Henricks, Musgrave, Runco, Voss. Payload: Atlantis F10 / DSP 16 [IUS]. Mass: 20,242 kg (44,625 lb). Nation: USA. Related Persons: Gregory, Hennen, Henricks, Musgrave, Runco, Voss. Agency: NASA Houston. Program: STS. Class: Manned. Type: Manned spaceplane. Flight: STS-44. Spacecraft Bus: Shuttle. Spacecraft: Atlantis. Duration: 6.95 days. Decay Date: 1991-11-30 . USAF Sat Cat: 21795 . COSPAR: 1991-080A. Apogee: 371 km (230 mi). Perigee: 363 km (225 mi). Inclination: 28.50 deg. Period: 91.90 min. Manned six crew. Deployed Defense Support Program satellite. Payloads: Defense Support Program satellite/ Inertial Upper Stage, Interim Operational Contamination Monitor, Terra Scout, Military Man in Space, Shuttle Activation Monitor, Cosmic Radiation Effects and Activation Monitor, Radiation Monitoring Equipment Ill, Air Force Maui Optical Site Calibration Test, Ultraviolet Plume Instrument, Visual Function Tester 1. 1991 December 2 - . Landing of STS-44 - . Return Crew: Gregory, Hennen, Henricks, Musgrave, Runco, Voss. Nation: USA. Related Persons: Gregory, Hennen, Henricks, Musgrave, Runco, Voss. Program: STS. Flight: STS-44. STS-44 landed at 22:36 GMT. .
1993 January 13 - . 13:59 GMT - . Launch Site: Cape Canaveral. Launch Complex: Cape Canaveral LC39B. Launch Platform: MLP2. LV Family: Shuttle. Launch Vehicle: Space Shuttle. STS-54 - . Call Sign: Endeavour. Crew: Casper, Harbaugh, Helms, McMonagle, Runco. Payload: Endeavour F03 / TDRS 6 [IUS]. Mass: 21,156 kg (46,640 lb). Nation: USA. Related Persons: Casper, Harbaugh, Helms, McMonagle, Runco. Agency: NASA Houston. Program: STS. Class: Manned. Type: Manned spaceplane. Flight: STS-54. Spacecraft Bus: Shuttle. Spacecraft: Endeavour. Duration: 5.98 days. Decay Date: 1993-01-19 . USAF Sat Cat: 22313 . COSPAR: 1993-003A. Apogee: 309 km (192 mi). Perigee: 302 km (187 mi). Inclination: 28.50 deg. Period: 90.60 min. Manned five crew. Deployed TDRSS 6. Payloads: Tracking and Data Relay Satellite (TDRS)-F/Inertial Upper Stage (IUS); Diffuse X-ray Spectrometer (DXS); Chromosome and Plant Cell Division in Space (CHROMEX); Commercial Generic Bioprocessing Apparatus (CGBA) A; Physiological and Anatomical Rodent Experiment (PARE) 02; Solid Surface Combustion Experiment (SSCE). 1993 January 17 - . EVA STS-54-1 - . Crew: Harbaugh, Runco. EVA Duration: 0.18 days. Nation: USA. Related Persons: Harbaugh, Runco. Program: STS. Class: Manned. Type: Manned spaceplane. Flight: STS-54. Spacecraft Bus: Shuttle. Spacecraft: Endeavour. Tested tools and techniques for extravehicular activity..
1993 January 19 - . Landing of STS-54 - . Return Crew: Casper, Harbaugh, Helms, McMonagle, Runco. Nation: USA. Related Persons: Casper, Harbaugh, Helms, McMonagle, Runco. Program: STS. Flight: STS-54. STS-54 landed at 13:33 GMT. .
1996 May 19 - . 10:30 GMT - . Launch Site: Cape Canaveral. Launch Complex: Cape Canaveral LC39B. Launch Platform: MLP1. LV Family: Shuttle. Launch Vehicle: Space Shuttle. STS-77 - . Call Sign: Endeavour. Crew: Brown, Bursch, Casper, Garneau, Runco, Thomas, Andrew. Payload: Endeavour F11 / GBA-9. Mass: 12,233 kg (26,969 lb). Nation: USA. Related Persons: Brown, Bursch, Casper, Garneau, Runco, Thomas, Andrew. Agency: NASA Houston. Program: STS. Class: Manned. Type: Manned spaceplane. Flight: STS-77. Spacecraft Bus: Shuttle. Spacecraft: Endeavour. Duration: 10.03 days. Decay Date: 1996-05-29 . USAF Sat Cat: 23870 . COSPAR: 1996-032A. Apogee: 285 km (177 mi). Perigee: 274 km (170 mi). Inclination: 39.00 deg. Period: 90.10 min. Deployed and retrieved Spartan 2; deployed PAMS-STU; carried Spacehab module. Payloads: Shuttle Pointed Research Tool for Astronomy (SPARTAN) 207/Inflatable Antenna Experiment (IAE); Technology Experiments Advancing Missions in Space (TEAMS) 01 (includes Vented Tank Resupply Experiment (VTRE), Global Positioning System (GPS) Attitude and Navigation Experiment (GANE) (RME 1316), Liquid Metal Test Experiment (LMTE) and Passive Aerodynami-cally Stabilized Magnetically Damped Satellite (PAMS) Satellite Test Unit (STU); SPACEHAB-4; Brilliant Eyes Ten-Kelvin Sorption Cryocooler Experiment (BETSCE); 12 getaway specials attached to a GAS bridge assembly (GAS 056, 063, 142, 144, 163, 200, 490, 564, 565, 703, 741 and the Reduced-Fill Tank Pressure Control Experiment (RFTPCE); Aquatic Research Facility (ARF) 01; Biological Research in Canisters (BRIC) 07, Block III. 1996 May 29 - . Landing of STS-77 - . Return Crew: Brown, Bursch, Casper, Garneau, Runco, Thomas, Andrew. Nation: USA. Related Persons: Brown, Bursch, Casper, Garneau, Runco, Thomas, Andrew. Flight: STS-77. STS-77 landed at 11:10 GMT. .